When the BC government unveiled its new water pricing scheme, we wrote that while a major increase, the amounts being charged seemed very low. It turns out that hundreds of thousands of British Columbians share that concern – as demonstrated by a SumofUs.org petition signed by 225,000 people, which has now resulted in a BC government commitment to review its water rates. But former MLA Judy Tyabji is claiming that increasing the water rates could cause BC to lose control over water under NAFTA, and is citing a 1999 West Coast Environmental Law legal opinion in support of her view. Consequently, we think it’s important to clarify that we agree with SumOfUs that there is room to increase water rates dramatically without running afoul of NAFTA or other trade agreements. The rates – access v. sale price? The new pricing for BC water was undertaken after extensive public consultations, in which, the government reports, “a consistent message from British Columbians was that water is undervalued.” … Despite the strong message that the public wants higher value placed on our invaluable water resources, the new pricing regime for BC water still clocks in as among the lowest in the country. We noted several examples of the low rates that industrial users might pay, including Nestlé, and suggested that conservation interests could be better served with higher rates. We don't sell the water. We never have in British Columbia. If you create water as a commodity for government — as a revenue stream — imagine what that does to conservation. Understand this as you sign the petition DEMANDING that the province charge Nestle for water: you are lobbying our government to turn our water into a commodity for sale. That's what you are doing when you post articles and petitions. You will make Nestle VERY happy if you succeed, because then we can NEVER turn off the taps due to the international trade deals in place. … Do NOT sign the petition do NOT ask that our water become a commodity. Both Polak and Tyabji propose a false dichotomy, suggesting that either water is (subject to an administrative fee) free or it is a commodity (that can be bought and sold). This is not correct – there are all kinds of reasons that government might charge for water use – a tax to raise funds, to encourage conservation, to reflect the ecological costs caused by the use of water – that have nothing to with the sale of water, and do not make the water a commodity. The question of whether water is a commodity has less to do with price and more to do with the legal rights granted by the legislation and whether they resemble private property rights. Can the water be bought and sold? Does the licensee have an ongoing right to receive the water? The concern that water might be turned into a commodity gave rise to considerable concern when, in 2011, the BC government floated the idea of water markets being included in the Water Sustainability Act, which might have allowed the licensees to sell water (a proposal which was abandoned). Similarly, the fact that the Water Sustainability Act guarantees early groundwater users priority in water allocation raises concerns that licensees may argue that their rights are like private property rights (despite the clear statements in the Act of public ownership of the water). What is meant by “fair price” really depends upon what BC is trying to achieve with a price. In our view, a fair price does not mean a market price, but rather a price that reflects full cost recovery – not just the costs of administering a program, but also addressing the environmental costs associated with the water use. 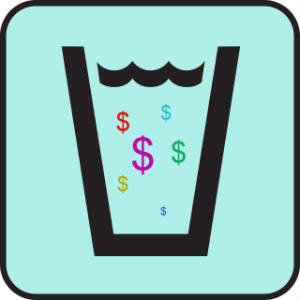 This may mean that prices should be higher in drought-vulnerable regions, or where the water use will pollute water (ie. fracking) or remove it from the system (water bottling). Even if the government wants to use new revenues from water pricing solely to run the water allocation system, that should be a system that has all the necessary information and tools to properly manage the water resources – including full mapping of all BC aquifers, measuring water flows and establishing environmental flow thresholds for water bodies, as well as staff on the ground to enforce the Water Act and the Environmental Management Act and other legislation intended to protect water quality and quantity. We are deeply skeptical that the current proposed rates, intended to raise $8 million per year, will meet such a standard. That’s why the government review of the rates is a welcome announcement. It can use more revenue to fully implement the new Act for sustainability. Our government knows that higher rates are possible – as evidenced by the fact that the rates are significantly higher in many other provinces, as high as $179/million litres in Nova Scotia. We’ve been pioneers in sounding the alarm about free trade agreements, and there are many legitimate concerns about how NAFTA addresses water. However, at least at this stage and at the rates we’re talking about, it’s premature to say that an increase in water rates would pose a problem under NAFTA. Our 1999 opinion, written by then Executive Director Steven Shrybman for the Council of Canadians (which, by the way supports higher water rates for industry), was focused on a different issue: whether NAFTA prevents Canada from stopping bulk water exports after they start. It did not focus on the issue of water pricing, and certainly did not have these water rates in mind. A 2011 report by the Canada West Foundation (CWF) specifically looks at water pricing and whether it could pose difficulties under NAFTA. The report concludes, correctly in our view, that the mere act of pricing water cannot force a government to allow bulk water exports. In the words of the report, NAFTA “cannot … be used to force the export of water where there is no pre-existing export…” That is the main conclusion of the Shrybman opinion as well. BC has long banned bulk exports of water, although an exception is made for bottled water, and NAFTA does not undo that ban. [A] water pricing regime that continues to be in government hands would have the least risk of offending NAFTA obligations …. Under the environmental provisions of NAFTA Chapter 11, such a measure could stand provided, again, that the environmental intent was both clear and justifiable. Compensation to investors might, however, still be an issue. The risk of possible compensation related to water pricing is arguably a reason to get the pricing right now. While the new Water Sustainability Act will apply an application fee and charge an annual water rental to ground-water extraction for the first time, when the law comes into force in 2016 (and for the first year the application fee is even waived for existing groundwater users like Nestlé) Nestlé and other groundwater users are also gaining rights that are legally enforceable against other water users, and it is reasonable to expect them to pay new fees associated with that right. Arguably it is only once the water pricing structure is legally enshrined that future changes might amount to an “expropriation” worthy of compensation. There are a lot of questions about how NAFTA relates to water, and few NAFTA decisions to provide guidance. However, in our opinion BC needs a robust, fair and credible water pricing system that encourages conservation and accounts for all environmental costs, and the risk that such a system would run afoul of NAFTA is minimal and should not stand in the way of increasing water rates to levels consistent with, or even higher than, other provinces.